As we are 24 more days from the ceremony to officially bring the curtain down on YAZAKI Samoa local operation, I would like to publicly acknowledge and share my own personal tribute to my departing family - my final vote of thanks and last goodbye before time is running out for me and the opportunity slips away. This is indeed so touching and emotional when we come to think of the local employees and the departing Japanese friends as well as the countdown continue. As such, it would be amiss for me if I don’t express the dear feeling of appreciation I’ve treasured for YAZAKI during my remarkable 10 years working there. I have been in the local workforce for 38 years. I was employed under the EXECUTIVE ARM OF GOVERNMENT for 20 years and with PARLIAMENTARY ARM OF GOVERNMENT for 18 years. All are wonderful jobs, beautiful places and fantastic bosses with a diversity of people with dissimilar manners, attitudes and kind of family blood-line mannerism. And thank GOD that I can remember the many memories of every single job; some good some exceedingly bad but it’s the nature of the sinful beast that causes all these; and many lessons being learned as well where the term ‘’Experience’’ has always emerged from. However, working at YAZAKI was sort of unique, much memorable in some instances and a rare experience for many reasons but one; it’s working with the ‘’Japanese’’ an unfamiliar culture. An irrefutable fact; YAZAKI at its 26 years of serving Samoa has contributed a lot to Samoa socially, environmentally and economically. It injects millions of talas into Samoa’s economy by way of employees’ income taxes and duties on non-production tooling. For employees; their take home pays, NPF contributions, loan repayments, monthly and annual employee awards, disasters relief package, paid maternity and paternity, long service leave package, free health clinics, end of the year gifts and bonus, free lunch, overtime transportation, uniforms, paid sports representative leave, bereavement leave, redundancy package, retirement package, management retirement package, community services support; annual salaries reviews, wages annual reviews on top of the annual anniversary for waged employees, staff association motivation programs, employees life insurance; condolences gifts, and many others. In addition, it has donated a lot of capital, books, uniforms, furniture, safety gears, computers and many other things to the religious groups; schools, villages, families and charitable organizations including Mapuifagalele. First and foremost; my thanks go to the two top men of the Yazaki Global Family namely Mr Yasuhito Yazaki the Chairman, and Mr Shinji YAZAKI the President. These two smart and intelligent men; down to earth attitude; committed and professional in leading and handling the affairs of the company contributed to the global success of its family inheritance after their father the late Mr SADAMI YAZAKI. It was indeed an honor to meet you both; personally in Japan back in 2009 Summer Camp; and shared the Special lunch head table with you and our then Ambassador Susuga Leiataualesā Kirifoti Eteuati and his good lady with other selected delegations. 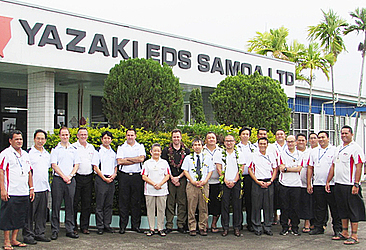 Thank you for allowing YAZAKI Company to operate in Samoa in the first place in collaboration with our Samoan Government. As such, the tremendous efforts and initiative of the late Prime Minister Hon Tofilau Eti Alesana and current PM Hon Tuilaepa Sa’ilele Malielegaoi with the government support should not go unnoticed. Thank you. Malō le silasila i ō tatou tagata ae tatalo ina fa’aauau pea ona uuna’i mai nisi kamupani mo Samoa e maua ai galuega a ō tatou tagata vaivai. Yazaki Company has done a lot to the Samoan people. Thank you to the YAZAKI brothers. Doumo arigatou gozaimasu. Arigatou gozaimashita and God Bless Yazaki Group in its journey. I am as well so grateful for giving me the golden opportunity to be one of YAZAKI global family members. Per se; I would like to express my special heartfelt gratitude to Mr Tsutomu Oba - Vice President [2005-2010] who recruited me as Manager Human Resources & Corporate Administration. You are such a wonderful funny little boss to work with, funny memories Oba san; ‘’No need to under’’ is your famous and humorous phrase but up till now, Oba san please ‘’me no understand what you mean’’ God bless you Oba san, wife and family in Japan Doumo sumimasen, arigatougozaimasu! To the current Vice President Mr Shunji Tange [2010-2017]; I thank you for being a role model to us myself in particular. A kind-hearted Samaritan. In times of financial struggle, you are there to help; in times of desperation; you are there to lend a hand to anybody. Thank you Arigatou gozaimashita . To former and current Japanese Management team, you have contributed in many ways. I say Sumimasen and God bless you fantastic people. Mr Craig O’Donohue the Managing Director and President and all AAPL associates, I say thank you all for your compassionate for the employees. To the General Manager; Afioga Funefeai Fonoti Mauta’anoa Oliva Vaai; Fa’afetai tele, Malo onosa’i i lau Afioga i le toe ‘Ulutaia o le kamupani; ua afu lau tautua i le Yazaki ma Samoa. Sa e pae ma auli i le tele o fe’eseeseaiga i le pulega ma le aufaigaluega foi ma taofiofi mau le i’umaea i le tofā fa’amatai ma le tagata matua na sologa lelei ai mea uma. Malo le fa’apalepale ma le fa’atoetoeaina. O lea sa tu i le tia le manu ae silasaaga i le seuga; ae ua malie malie ō mata o le soāseu ina ua ifo le fui i le ga’a. Malo le onosai. Ia maua pea lou malosi e fa’aauauina ai nisi tiute ile lumanai. To the Senior Manager Corporate Administration; Afioga Pesetā Peter Tone; Fa’amalō le fa’apalepale ma le agamalū i lau Afioga. E fetaui lelei upu nā i Lau Afioga auā o uiga nā sa e fa’afoeina ai le Kamupani mo le 10 tausaga na ta taunu’u fa’atasi ai i le Yazaki. Ia e lē tau lae’iina le pā osofia i tomai ma taleni mai le Atua oi lau Afioga mo nisi tiute i le lumanai..
Money is the ‘’heart’’ of any business and there is no need to keep this under wraps as it does no harm anymore and YAZAKI is closing down in three weeks time. Memories as my final wishes for my departing family. In early 2007 to late 2008, YAZAKI Samoa was on the verge of closing down due to heaps of financial problems which indeed resulted in a massive redundancy including Managers. But with your advanced accounting and auditing expertise Peseta; with the help of our then Senior Finance Manager Naoto Fukaya’s advanced accounting background; and with my small knowledge and understanding of policies and legislations gained from PARLIAMENT, we carefully put in place our Saving Strategies Plans where many financial policies of the Company were either repealed, discontinued with or modified in our first 18 months in office; in order for the company to survive. WOW!! We did it and thank GOD YAZAKI survived for another 10 years [2007-2017]. Much of the financial burden and losses at the time were due to excessive abuses in many areas, unnecessary spending and mainly at the Payroll; and my detection of a ‘’huge theft’’ during my audit in 2008; where close to half a million was lost at payroll by a scandal which was smartly maneuvered undetected for years; then millions were then saved had the scandal continued for another year or so. The culprit was jailed back then. That never goes away from my memories and proud to have detected it myself; saving money for YAZAKI’s continuation. From then onwards, Action Plans were put in place at the payroll and thus transferred payroll auditing under my control and spending was strictly in control as well. What a team we had at the Corporate Administration in time of the company’s financial difficulties. A proud moment for me and GOD knows everything we have done and I am so thankful to Him that I was part of that Saving Plan. O tautalaaso le igoāipu o le isi tamaloa… Peseta, o lenā ete talavou fa’atoā e 21 ete le’i taitai brother ae o a’u ua fa’asolo ina mumū itiiti atu lava le molī ma fa’asolosolo pē atu ai lava ma tā feto’ito’i ma le logo latou. Ae a? L O L. Pau le mea ia maua le ola e fai ai nisi auaunaga pe ā finagalo iai le Atua. Peseta, ia maua lou soifua laulelei ma ia sagai ane ai o le tai i lau fa’atamasoaliiga ae matou tapua’i ma tatalo mo ou faiva. God bless. To my fellow Samoan Managers and close friends namely; Afioga Toleafoa Malaeloa; Manager Logistics, Shipping and Warehouse, Tofā Mulitalo Iosefa Fiāalii – Quality Assurance [QA] Manager, Susuga Puea Fiti - Engineering Manager, Tamaita’i Pule o Muluga Tupa’i - Production Manager with ALL Assistants Managers. You are all experts at your own field and area of control. Great efforts! Seki a! Malo le onosa’i e lē faigofie le galuega. Malo le fa’atoatoa auā e leai se faiva e asa ma se maumau. Ua tau lau o le fa’amoemoe sa outou fitāituga ai nei; e oso a’e pea le lā ma e fai aso le ALII. E lē pau fua lo outou afu i le eleele. Manatua: ‘‘God does not call the qualified but HE does make qualify the One He calls - E lē vala’auina e le ATUA le tagata agava’a ae fa’a-agava’aina e le ATUA le tagata ua vala’auina’’. Source: Archbishop Alapati Lui Mataeliga Homily. Last but not least, to ALL Supervisors, ALL Foremen, ALL Leaders, ALL Sub Leaders and ALL current and former employees; not forgetting those who have passed unto the eternal rest; may they rest in peace; for without whose ready efforts and steady patience YAZAKI Company would have never been around for these long 26 years. Your work and efforts would not have been lost in vain. As the countdown continues it is so sad and emotional for me personally every time I look at employees in the morning rush from 4.00am while everyone else is in deep sleep and 5.00pm race down to the main road to look for buses heading home. Talofa e! O fautuaga lava nei ou te tautala so’o ai i lō outou mamalu. O le fa’amaoni o le ticket lenā i soo se galuega ma e tele lava galuega. A lē o lea fo’i, fo’i i tuā i nuu ma aiga e gagau le vao; fai se maumaga, totō ni fa’i, ta’amu ma ufi ma isi mau fa’atoaga. E tele nauā eleele o aiga e le’i fa’ato’aina ae ‘aua le taxi solo i le taulaga pei se turisi ae leai se tupe ma fa’amaumau ai le taimi tāua na tuu mai e le Atua e fai ai mea aogā uma auā Lona Viiga …A lē o lea fo’i; talosaga i galuega fa’avaitaimi i fafo Niu Sila ma Ausetalia. A manuia; sui ma pulea le amio, fa’amaoni ma toe fo’i lelei mai i Samoa nei pe ā uma le taimi fa’atulagaina mo le isi taimi i le lumana’i ae ‘aua le fosia i le maso le mea.. Fa’amanuia le ATUA iā te outou uma. MY YAZAKI FAMILY, the wind of change will always be blowing and continues blowing and will carry you away in four weeks time. MY FINAL WORDS ‘‘If I forget you YAZAKI, let my right hand wither and my tongue cleave to my mouth. It is awesome feeling to meet you but it’s very hard to say good bye to you after a long relationship. But After ALL Its life! We have to move on. Until we meet again.’’ GOODBYE YAZAKI…. *Mulipola Peato Mikaele TOLUONO was YAZAKI SAMOA’s Manager HRD and Corporate Administration for 10 years-now retired. He was also ACEO and Assistant Clerk of the Legislative Assembly at Parliament Mulinu’u for 10 years. He is a Catholic Church Apologetic in his own right and has defended the Catholic Church teachings in particular the Marian dogmas and Abortion in this newspaper since 1990. As a regular Contributor and an Advocate of good governance, accountability, transparency and justice and as responsibly accountable to his own views as he always does; he puts his name and photo alongside his Articles in the Samoa Observer every time he writes.